You will be given a reference e-book to read which has 246 pages And the test will be based on that e-book , you can take the test only after 10 days Of &nbsp;purchase. IT project management can be defined as the process of organizing, planning and defining responsibilities that are extremely useful in completing the specific information technology (IT) objectives of an organization. According to experts, the IT project management process is composed of five basic stages namely the planning, initiation, execution, control and closing. It is also known as a part of the most valued expertise in the field of information technology. Whether you are a beginner or a veteran in information technology, you should know that learning more about how the IT project management process works is a major help in successfully accomplishing all your tasks. You can get more information about this process by taking part in an IT project management certification program. Project management designed for the IT industry is also known as the process of applying modern techniques and systems for the purpose of effectively executing projects from the start up to the end and in achieving the predetermined goals of quality, cost, time and scope. The entire process also takes advantage of various techniques and systems in carrying out projects that require designing, installing, developing and implementing computer technology including networks and applications. It should also be noted that there are three major constraint factors that can affect the results of using IT project management for the IT projects of an organization. These are the cost, time and scope. IT project management certification holders know exactly how to make adjustments on these constraint factors to increase their chances of producing successful results out of their IT projects. Deciding to get your IT project management certification from Brainmeasures is one of the soundest decisions that you can ever make since this online certification company is known for its legitimacy and its ability to supply its practitioners with relevant information related to their chosen certification course. 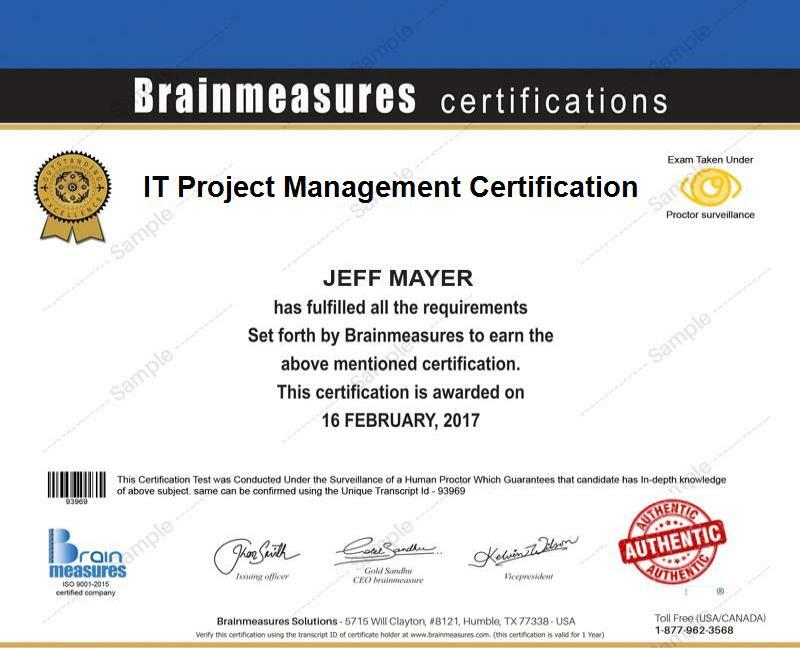 This means that Brainmeasures can offer you the most comprehensive IT project management certification program so you will become more familiar about the ins and outs of project management as it relates to the IT industry. The company also works hard in accurately evaluating the skills and knowledge of those who have taken the certification course by allowing experts to create the most updated and error-free project management exam. The creation of the exam is also ruled by ISO standards. After you successfully pass this exam, you can get your certificate which can prove that you are a certified and expert IT project manager. If you are one of the many people who are aiming to get their IT project management certification from Brainmeasures, then rest assured that you will never find it hard to do this since the company can make you a part of the program without requiring a lot of documents and qualifications. But the entire program is primarily designed for people who are tasked to manage information technology projects but whose knowledge about the IT project management discipline is still limited. You can expect the program to be perfect for those who are holding IT management positions in not-for-profit industries, state, federal and local organizations or agencies and private industry. The expected annual salary for IT project management certification holders is higher in comparison to the salary of those who practice the profession without any certificate. Your annual earnings can be expected to range from $61,000 to $116,000.